Amatul-Wadud has longstanding ties to Muslims of America (MOA), a front group for the extremist Jamaat al-Fuqra. On December 19, CAIR Massachusetts put up a Facebook post congratulating Tahirah Amatul-Wadud, a CAIR-MA board member, for her announcement that she is running for Congress. One would think, given that CAIR faces recurring condemnation for its links to extremism, that they would be more circumspect about broadcasting their connection to Ms. Amatul-Wadud — who is deeply enmeshed in one of the most dangerous extremist groups in the United States. 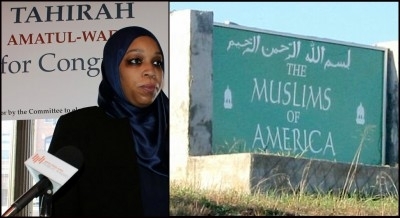 As she notes on her professional website, Ms. Amatul-Wadud is the general counsel for a community calling itself Islamberg, near Hancock, NY. Islamberg was founded by Pakistani cleric Mubarak Ali Gilani. Gilani is the leader of the extremist group Jamaat al-Fuqra, which operates in the United States under the name "Muslims of America" (MOA) — and in fact, Ms. Amatul-Wadud is the lawyer not just for Islamberg, but for MOA itself. MOA has been under Federal investigation since the 1970s (resulting in several arrests over the years) for connections with international terrorism, pervasive criminal and fraudulent activity, and the stockpiling of illegal weapons. Videos taken in Islamberg and other MOA "villages" across the country show members undergoing basic guerrilla training; the most promising recruits, FBI sources allege, are sent to Pakistan for more advanced training and religious indoctrination from Gilani personally. Of course, even criminals are entitled to legal representation (though wise voters would hesitate before electing a Mafia attorney as their representative in Congress). However, Ms. Amatul-Wadud's relationship with Jamaat al-Fuqra is more than just professional. In 2015, she shared a Facebook post from MOA of a long and unhinged 2014 article by Sheikh Gilani himself. Based largely on the widely-debunked forgery Confessions of a British Spy, Gilani claims that the terror group ISIS (and indeed, Wahhabism itself) is a creation of British intelligence, that 9/11 was an inside job, that WTC-7 was destroyed by controlled demolition, and that America was manipulated into fighting Nazi Germany and Saddam Hussein for the benefit of the Jews. For Ms. Amatul-Wadud to endorse this sort of conspiracy-theorizing is extraordinary. Furthermore, internal MOA documents from the 1980s and 1990s indicated that at least two MOA members with the surname of Amatul-Wadud applied for membership in Sheikh Gilani's secret "Soldiers of Allah" militant force. 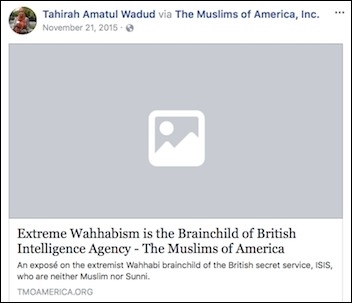 While Tahirah Amatul-Wadud can hardly be blamed for the extremism of older relatives, this connection does give credence to the claim (made by a former member of MOA) that her schooling was paid for by the Jamaat al-Fuqra, and that she was groomed for her present role. Ms. Amatul-Wadud manages to make the other CAIR-MA board member running for Congress, Nadeem Mazen, look positively cherubic (despite his own issues with extremism). And for CAIR-MA to have her on its board, despite her professional accomplishments, is troubling. Either CAIR-MA was not aware of how dangerous MOA is, or they remain willfully ignorant, or (worst of all) they do not mind.